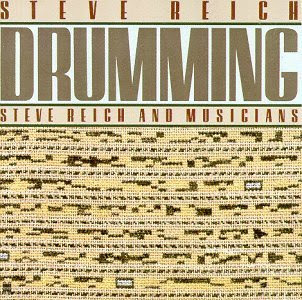 Steve Reich may be most well known for his groundbreaking juggernaut Music For 18 Musicians; it’s truly unfortunate when most listeners don’t reach beyond that obvious landmark. Written nearly a decade prior, this piece is one of the most unified, thorough explorations of a concept in the renowned composer’s towering oeuvre. Drumming is an unequivocal masterpiece of singularly blinding focus. The title and cover art alone convey more about this landmark than any copious wordplay could aspire toward. It’s equivalent to Reich’s artistic kernel, a core sample taken from the root of his genius. The ideas contained herein were expanded and mutated into everything composed in the intervening years. This is the skeleton, the blueprint, the foundation. Of course, it’s also a hypnotic masterpiece, a fully realized evocation of everything interesting about modern minimalism. The drum patterns evolve so quickly and naturally that when layers begin dissipating near the final movement in a slow decrescendo of complexity, the feeling is akin to being woken gently out of a deep slumber: peeling back comfortingly warm layers of blankets until the cool air sparks movement and consciousness. Emerging upon the final moments, the most immediate, compelling notion is to hit snooze and resume the dream, from the beginning. Drumming is a state one leaves reluctantly and with hesitation. Thankfully, we need not wait until twilight to re-experience this particular dream. I wanna see how great this percussion is! THANKS!